Seabirds circled ominously overhead, as though looking to recover their lost nesting material. “Yes, well, you paid a handsome sum. Up front, I might add. And I, for my part, neglected to mention I had it in mind to drop you off at this point and let you swim the rest of the way.” To his credit, he seasoned this confession with a look of apology. He gestured past the lurching bowsprit, but the Captain refused to even glance in that direction. But everyone on board had already seen the gloomy edifices transforming a stretch of the horizon into a saw’s edge. They all knew what awaited them there. He cupped a hand to his mouth, ready to shout the order to his crew. Most were scattered about the deck and rigging, waiting in silence and very likely praying for this very decision. “I wouldn’t stand for that,” said Midengar’s sword. “Eh?” The Captain blinked and searched the immediate vicinity. Midengar merely sighed and rolled his eyes at the clouds. His not-so-trusty blade had been mercifully quiet for the voyage, possibly owing more to a spot of seasickness than the fact that Midengar had asked it nicely before they had left port to ‘keep it zipped’. Now that it had piped up, Midengar was feeling faintly queasy, but that had nothing to do with the heaving seas. He had a niggling suspicion that the weapon, bored with long days cooped up in its sheath, was spoiling for a fight. Still, he could not deny that the sword – pun unintended – had a point. Midengar sighed and drew the weapon. It flashed eagerly at the Captain’s throat. Midengar sighed again and inched the tip away from the mass of beard. The crew were still frozen in mid-gasp and the Captain hadn’t even had time to properly unfold his arms. He stood there now, all awkward and flummoxed, not knowing where to put them. The Captain blanched a shade that suggested he had heard something of the longsword’s reputation. That was just the sort of fame – or infamy – that would go straight to the sword’s pommel. The pommel being the part of the weapon that Midengar tended to think of as its head. Its makers had, thank the ancestral gods, neglected to give it a face but, in their finite wisdom, had carved the semblance of a mouth in the pommel. If one watched as it spoke, it could even be observed flexing those metallic lips. But Midengar never did, because whether speaking or resting, the mouth’s repertoire of expressions was limited to a range of condescending smirks, every one of them as grating as its interminably snooty – and never once whispering – tone. It was a feature somehow always less widely known than its fighting prowess. 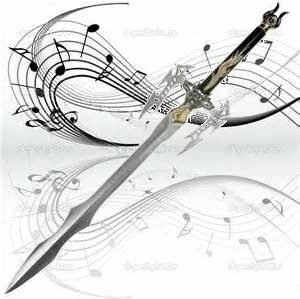 The Captain’s initial fear was giving way to irritability, but that was exclusively down to having the tip of the blade waved in his face. “If necessary,” said the sword. “All the more reason to get out of here! Now!” He shot furious looks at the nearest sailors. They were a rum lot – the kind of crew for whom the word ‘motley’ had been devised – and their mood was making them a darn sight uglier. “None of you move!” warned the blade, which quivered menacingly despite Midengar’s steady hand. In truth, he might have need of their help to facilitate his own getaway, but it was important to sweeten the current deal with a decent severance package. Even if only a few of them believed they might leave the island so easily, they might be persuaded to co-operate for the time being. Slowly, grudgingly, two of the men moved forward to seize their (ex) captain by the arms, while another fetched a coil of rope. The Captain bruised the air cruelly with curses and even some of the hardiest sailors visibly flinched, but he elected to forego the indignity of a physical struggle. At least his men, rather than Midengar, were the targets for the murderous looks he threw liberally about the deck. When the fellow was securely lashed to the mast, Midengar relaxed. He put up his sword and favoured the obliging shipmates with a smile. “You idiot. You didn’t think to gag the man?” The Whispering Blade of Alchemis sounded more disparaging than usual. What was worse, Midengar had to berate himself for overlooking such a simple detail. A surly mob of sailors surged forward, with more behind them, pouring up from the main deck and swarming down from the rigging. Those that weren’t wielding cutlasses grabbed mops, boathooks and even one or two buckets. Roaring, they didn’t look like they’d stop at throwing him overboard. Midengar whipped out the sword again and braced himself for battle – and a lecture. 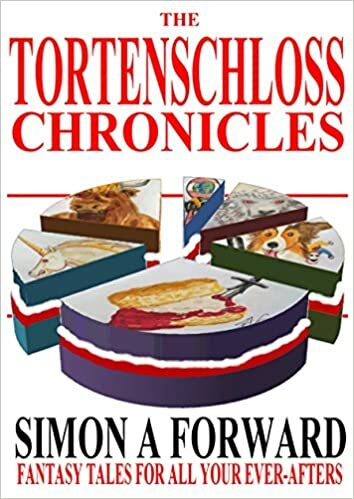 Tortenschloss is inhabited by a great many adventurers of all shapes and sizes besides the central heroes. Some of them play minor roles, some feature in ‘cameos’. So while the heroes (rightly) get most of the attention in the main story, I thought it would be fun to explore some of these other (some would say ‘lesser’, but don’t let them know that!) heroes and their adventures here. As well as a means of getting to know some of the inhabitants, it should offer a chance to visit other places in the Tortenschloss world. I say ‘should’ because these tales are works in progress and are largely ‘made up as I go along’. So I won’t always know where they’re leading. We’ll just have to hope the characters let me know some time before the end. Above all they are an exercise in creativity. The approach with these stories is generally to write a little from time to time (in the spaces between other projects!) and see where the words take us. Readers are free to comment, point out where these tales could be improved, which characters they prefer or even suggest twists and turns they could take if ideas occur. The adventure begins anew on January 14th 2013. Watch this space.